The Simon XT wireless security system is perfect for home or small business use to protect your property, family and employees. 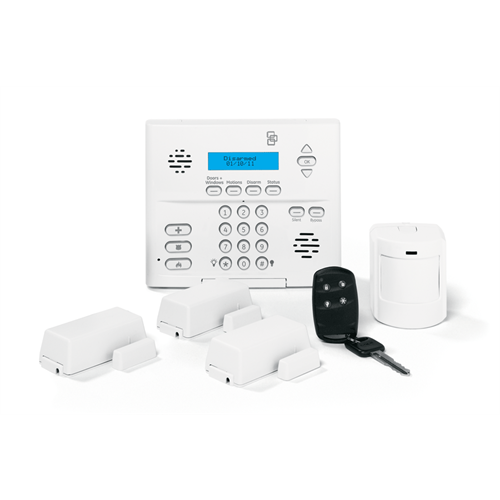 This is an installer grade alarm system that can be professionally monitored, or it can be programmed to report by voice to an off site telephone or cell phone for self monitoring. The built-in menu and voice prompts guide the user through set up and daily use. Expandable to 40 wireless sensors, this kit includes 3 wireless door/window sensors, a wireless pet immune motion detector and a wireless keyfob. You can easily add additional GE wireless sensors or a secondary keypad. The Simon XT features voice prompts and remote telephone control functions for arming, disarming, status, and latchkey functions. The latchkey features can be set to notify parents if the system has NOT been disarmed by a certain time. The Simon XT supports up to 40 wireless zones or 38 wireless and 2 hardwired zones. It has a chime feature for monitoring window/door modules. Your purchase will include the quick start manual. Installer's manual including installer codes, are available for download from our web site.